furnace. But what is inside the sealed duct work? Approximately 20 lbs. 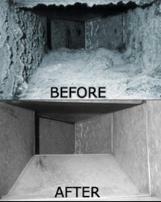 of dust and debris move through your HVAC system annually. 1) Do you notice a lot of "lint like" material catching on the vent covers? 2) Do you think the air coming out of your vents has an odd odor? mildew, or mold growing inside your duct work. sucked in or swept into the HVAC system during the original construction of the house. a house it is often contaminated well before the first homeowners even move in.